Since initial work by Jobsis (1) indicated Near-Infrared Spectroscopy (NIRS) as a tool for the analysis of muscle oxygenation, more reviews of current applications of NIRS in sport science can be found e.g. in Wolf et al. (2) and Grassi and Quaresima (3). The basic premise is that muscle oxygenation is expressed by the haemoglobin oxygenation, i.e. the oxygen content of the red blood cells and this can be measured by optical methods as the oxygenated and deoxygenated haemoglobin components have a different absorption spectrum for near infrared light. While earlier approaches could measure changes in the oxygenated and deoxygenated haemoglobin concentrations (oxyHb and deoxyHb, respectively) only, advanced methods like spatially-resolved spectroscopy allow the oxygen saturation of haemoglobin SO2 = oxyHb/totalHb to be measured, where the total haemoglobin concentration totalHb = oxyHb + deoxyHb. SO2 is expressed in percentages (%) and the haemoglobin concentrations (oxyHb, deoxyHb and totalHb) are expressed in arbitrary units (as the exact properties of the tissue are unknown). 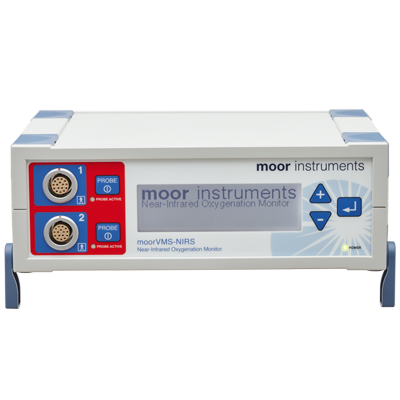 We recommend the moorVMS-NIRS, moorVMS-PC software and NP1 probe. Noninvasive, Infrared Monitoring of Cerebral and Myocardial Oxygen Suffi ciency and Circulatory Parameters. Progress of near-infrared spectroscopy and topography for brain and muscle clinical applications.